You may choose up to two additional toppings per pizza at a charge of $2.25 per topping, per pizza. PLEASE READ!!! Someone MUST be present to receive Rastrelli’s Express PizzaKits shipments. Rastrelli’s will not be responsible for items that have been left unattended. Deliveries occur during regular business hours. Rastrelli’s will not be responsible for orders which cannot be delivered due to recipients not being available to accept delivery. A signature is not required for delivery. Residential or business address are required where a recipient will be available during normal business hours the date of scheduled delivery. We cannot deliver to PO Boxes. SHIPPING: Rastrelli’s Express PizzaKits will be shipped via the US Postal Service. Overnight or 2 to 3 day Priority Mail delivery is required to guarantee our excellent quality. USPS may not leave shipments if no one is available to accept the delivery. Rastrelli’s is not responsible for products which are damaged due to missed deliveries. 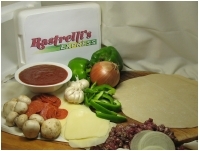 Rastrelli’s Express PizzaKits are packed in a custom Styrofoam box with cooling packs and are shipped USPS Overnight or Priority Mail. You will receive an email message confirmation when your order has been sent (if an email address was supplied when the order was placed). Please note: Rastrelli’s Express PizzaKits will be shipped on Mondays, Tuesdays or Wednesdays ONLY in order to guarantee delivery prior to the weekend. Overnight, weekend delivery is available only by special request and additional charges will apply. Incorrect addresses will result in additional charges for re-delivery. Shipping charges are based on total weights. Returns: PizzaKits cannot be returned once received. However, if you are not satisfied with the quality, freshness or condition of your order, we will gladly replace or refund your money. However, you must contact Rastrelli’s by phone, within 4 hours of receiving the order to report your concern. Rastrelli’s MUST BE NOTIFIED, BY PHONE, OF ANY INCOMPLETE OR INCORRECT ORDERS WITHIN 4 HOURS OF RECEIVING THE PIZZA Kits . IF Rastrelli’s IS NOT CONTACTED, Rastrelli’s WILL NOT BE RESPONSIBLE FOR ANY ADDITIONS, DELETIONS, CREDITS, ETC. TO THE CUSTOMERS. CUSTOMER MUST ACCEPT DELIVERY OF ALL PIZZAKITS. IF AN ITEM IS DAMAGED, WE WILL EITHER RESHIP OR CREDIT YOUR ACCOUNT, AT RASTRELLI’S DISCRETION. WE CANNOT REIMBURSE, REFUND OR RESHIP DELIVERIES THAT HAVE BEEN REFUSED. We appreciate your business and will work hard to make sure that your order is shipped quickly and safely. We hope you enjoy our PizzaKits. PLEASE send us your comments so that we may know how to serve you better! I grew up in Clinton and loved going to Rastrelli’s and ordering the pizza. I live in Seattle now and look forward to recieving this pizza kit gift for birthdays, Christmas and Valentines day from my mother. The pizza always arrives cold packed and fresh to bake and tastes just like I was eating it in the restaurant! And you cannot beat the quality for this price. Having grown up going to Rastrelli’s t least once a week,I am turning cartwheels with joy now that I can order the fantastic pizza online!! We have the best barbecue here in Texas,but the pizza situation is pretty sad!! We live in the Washington, D.C. Suburbs of Northern Virginia and LOVE the fact that we can now throw pizza making and eating parties with family and friends.. Brings back so many great memories of Clinton, Rastrellis after ball games, etc. it’s always on our “must do” list when we are in town for a visit, and now an occasional treat that everyone loves.. Thanks! !